Outside of a Prohibition period piece set in upstate New York, or if you’re Prince, wearing a cravat or an ascot is largely seen as a laughable sartorial choice. To don such a garment is to automatically be judged as ludicrous and affected, trying to revive a style that fell by the wayside. In truth, the issue is chiefly that the only people trying to revive this style tend to be individuals who are already a bit absurd, which forces their neck wear to bear the same classification. The same was true of the Trilby hat before Justin Timberlake and many artists in the hip-hop community revived it. The same sort of Renaissance is all that is needed to resuscitate the ascot. To help learn how to be part of the solution and allow these exciting accessories to enter your rotation, you need only to determine when, where, and how to give them their proper due, and not disrespect their place. It’s a matter of attitude and ensemble, along with the keystone of any bold choice: Confidence. Though these words tend to fall into the category of outdated and thus have had their exact meaning diluted with time and disuse, it’s important to understand them before you go wrapping things around your neck. The term comes from Croatian mercenaries who operated with France during the 30 Years War. They wore distinguishing neck gear which was originally named Croate, the French term for Croatian. Somewhere along the line that word was bastardized into cravat. Though all manner of neck decoration was popular prior to the 1600’s, through some linguistic turn of fate, this became popular. 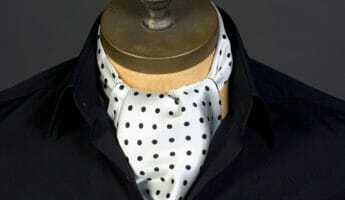 As a term, Cravat refers to anything worn around the neck. 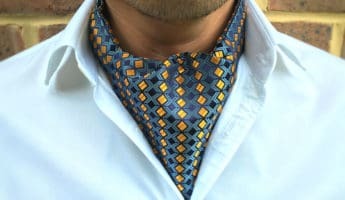 A necktie is technically a cravat, as is an ascot. Bow ties, clip-ons, and even necklaces are technically cravats. Scarves are cravats. Therefore, you’ve already been wearing a cravat anytime you put on a tie. As with many interesting fashions, the Ascot harkens back to horse racing. Specifically, the name refers to the Royal Ascot, which is England’s Kentucky Derby where attendees are expected to dress in morning formal fashion. The original ascots were bundles of silk knotted twice and held by a pin. Ascots eventually evolved out of this and became an acceptable type of cravat to be worn when a necktie or bow tie were considered too formal. 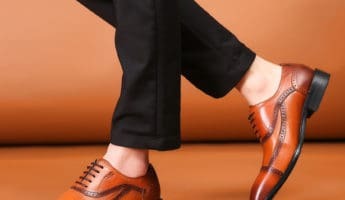 Pairing them with a blazer, a V-neck sweater, or a vest was a common way of showing that you were dressing up to dress down. Hugh Hefner famously tended to pair them with his smoking jacket attire to show that his style wasn’t sloth or slovenliness, but a choice. Though we think of ascots as excessively dressed up, they’re actually a middle ground between a collared shirt alone and one with a tie. 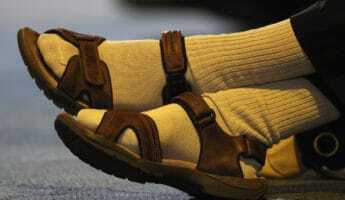 As such, they should be worn casually. Warm days when you want to open your shirt a few buttons, but don’t want to appal the world with your chest hair, an ascot is a playful choice. 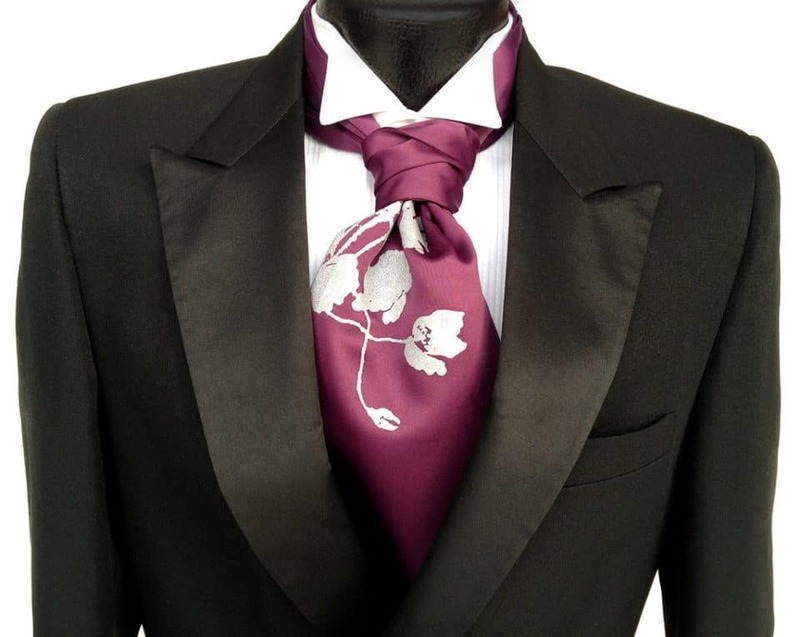 Weddings – so long as you aren’t in the wedding party and therefore required to wear a particular outfit – casual business meetings, luncheons, cocktail or dinner parties, or travelling for recreation are all exceptional times to throw on an ascot. 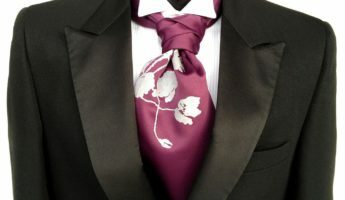 Formal ascots, which are often used as large ties, can often be a dressy way to spice up your tuxedo. These are worn only with formal wear and are the only kind of ascot that is worn atop your shirt, as you would a standard necktie. Unlike ties, which are worn outside the clothing, casual ascots go beneath your shirt and rest right against your skin. This is important to note, as anything with a texture, or any fabric that is uncomfortable should automatically be discounted. Silk is the preferred choice for an ascot, and it’s wise to never go outside of that fabric lest you run the risk of irritating your skin. 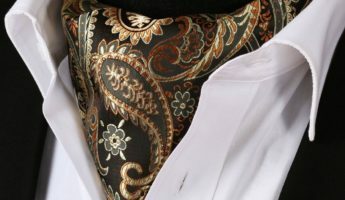 Any ascot you choose should also be a solid piece of fabric that is printed, but never woven or bearing much in the way of texture. 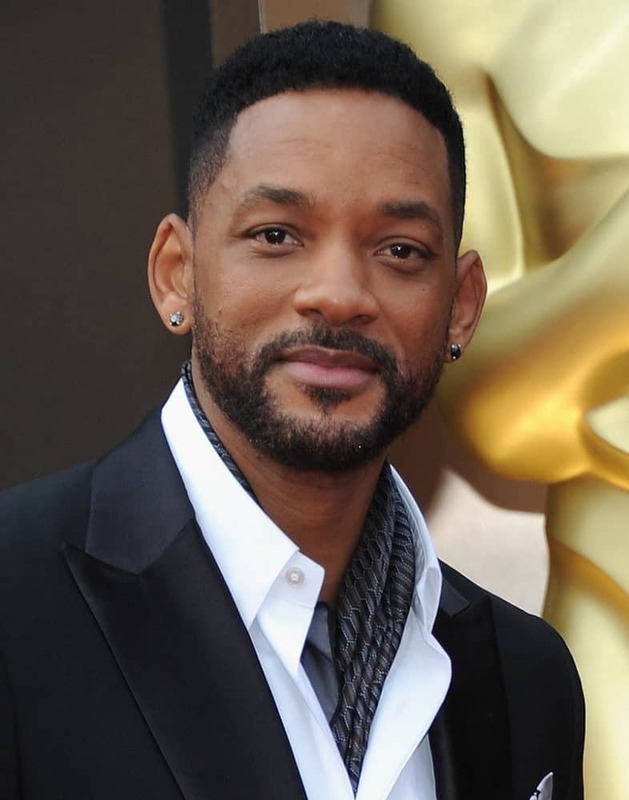 The reason is not only to protect your skin, but because texture can catch on the whiskers of your face whenever you lower your head, which will destroy the ascot. 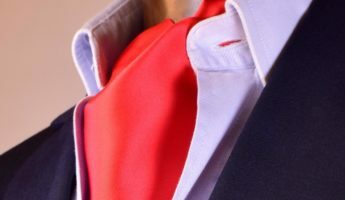 The simple rule to follow when choosing how an ascot looks is to consider the outfit you’re going to be pairing it with. 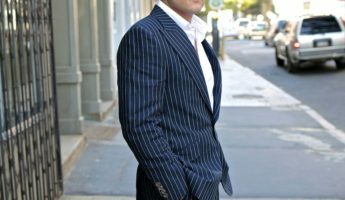 Patterned ascots look best with plainer shirts, sweaters, or sport coats, while ascots of a single color should be put with outfits that have more patterns built into them. The rule here is basically the same as with ties. If you start mixing patterns together, you look too busy and your garb will give people a headache. If you go with the same pattern as your shirt or jacket, you start creating an odd uniform look that lacks contrast, which comes across as awkward. You might as well be wearing a jumpsuit. Being more casual, and thus not typically designed to impress upon others your adherence to social conventions, ascots should be brightly colored and flashy. 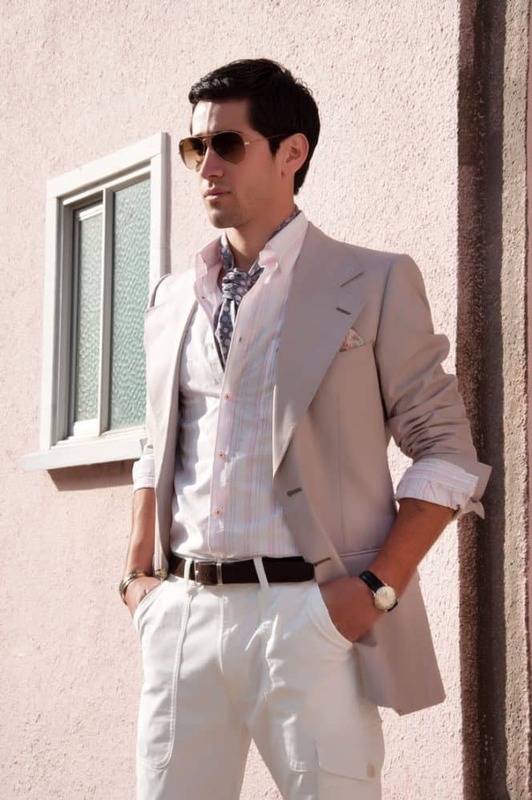 Even if you’re choosing a formal ascot, it doesn’t need to be as muted as a standard black or white tie. The point is to stand out, not to blend in. 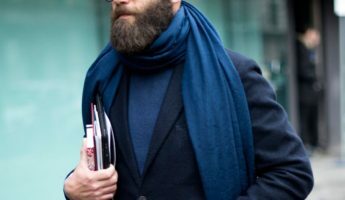 The exception to this rule is if you’re already wearing clothing that is louder or more ostentatious, then you can tone it down with a plain ascot in navy or black. 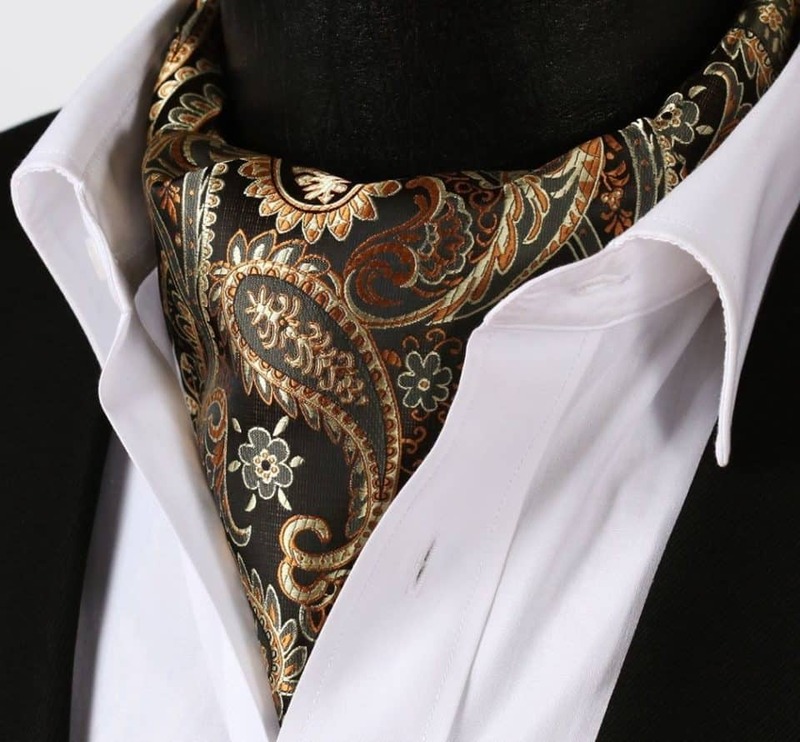 Since it’s almost always going to be made of silk, your ascot is always going to have a bit of shine that sets off whatever else you’re wearing. 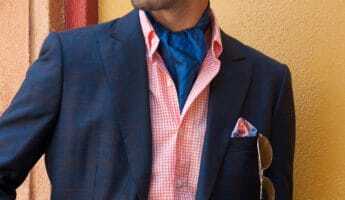 This is a big concern among many who aren’t sure how to meld the ascot with the pocket square. Unlike with ties, which shouldn’t be matched to an accompanying square, it’s perfectly fine to have a matched set of cravat and square. 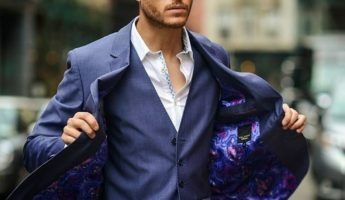 The easy way to determine what pocket square goes with your ascot, and vice versa, is to keep in mind that the square is meant to be the glue that holds disparate aspects of your ensemble together. It’s supposed to blend and meld, while ascots are intended to be show-stoppers that draw the gaze. 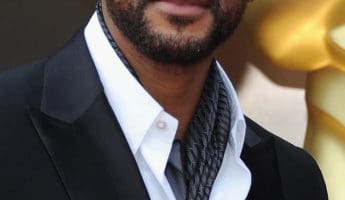 Normally, getting colors from all facets of your clothing into a square is the way to go, but simply reinforcing your ascot is acceptable also. Ascots are backed by a set of unusual pleats that can be confusing. 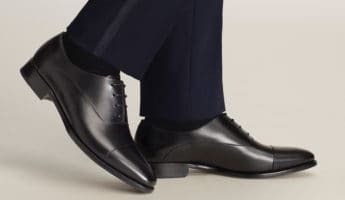 In fact, these are for function rather than form, meaning you can largely ignore them. You can wear them on the outside of the ascot or the inside. It doesn’t matter. 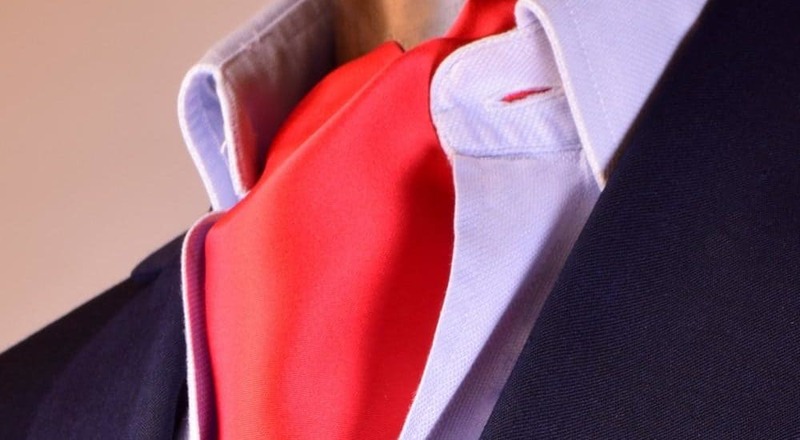 What does matter is that these pleats are part of the knot, since they’re intended to keep the ascot’s tie from unravelling. Hidden or showing is immaterial, so long as they’re doing their job.